WikiLeaks founder Julian Assange’s nearly seven-year stay at Ecuador’s embassy in London came to an abrupt end on Thursday when police entered the building and arrested him after Ecuador withdrew his asylum. Assange has been living at the embassy in London’s plush Knightsbridge district since 2012 when he sought refuge there after being accused of sexual assault in Sweden -- allegations that have since been dropped. Footage shot by Ruptly, a video news agency, showed a frantic-looking Assange, with a large white beard, being carried down the embassy steps by several men into a police van. 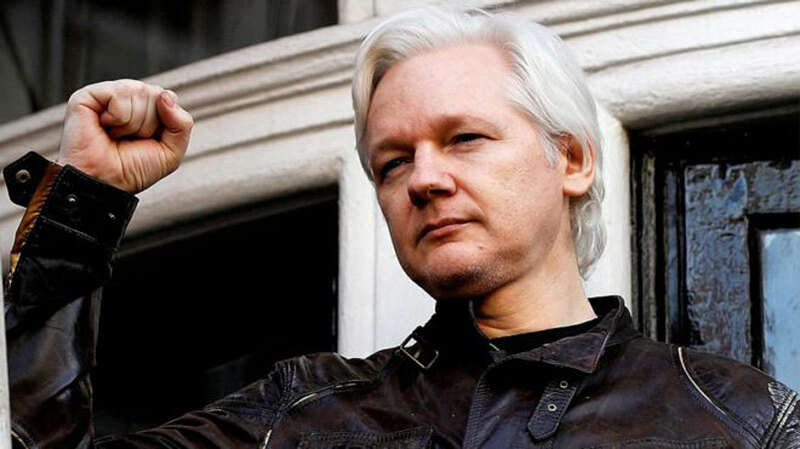 “I can confirm that Julian Assange is now in police custody and rightly facing justice in the UK,” British Home Secretary Sajid Javid said on Twitter. “No one is above the law,” he wrote, thanking Ecuador for its “cooperation” in the long-running case. WikiLeaks accused Ecuador of breaching international law by withdrawing his asylum and said the country’s ambassador to London had “invited” police into the embassy building to carry out the arrest. “Ecuador has illegally terminated Assange political asylum in violation of international law,” the whistleblowing website said on Twitter. Russia accused Britain of “strangling freedom” with Assange’s arrest, in a Facebook message by Foreign Ministry spokeswoman Maria Zakharova. The 47-year-old Australian was due to appear in court later on Thursday. He faces prosecution for breaching the conditions of his bail in Britain in 2012. He had refused to leave the embassy, fearing ultimate extradition to the United States where WikiLeaks said he faces charges over his website publishing huge caches of hacked State Department and Pentagon files. Ecuador's president Lenin Moreno said it withdrew Mr Assange's asylum after his repeated violations to international conventions. But WikiLeaks tweeted that Ecuador had acted illegally in terminating Mr Assange's political asylum "in violation of international law". Home Secretary Sajid Javid tweeted: "I can confirm Julian Assange is now in police custody and rightly facing justice in the UK. "I would like to thank Ecuador for its cooperation & metpoliceuk for its professionalism. No one is above the law."